Published on 30 Jun 2014 at 7:34 pm. Google began the event talking about the millions of people watching the live stream and the thousands at the event. They highlighted the all-female development team watching in Nigeria. They then pointed out that Android gets over 1 billion activations every day. There are 93 million selfies taken every day. Android tablets now account of 62% of tablet shipments. This statistic does not count variants like the Kindle. AndroidOne is a set of hardware reference platform to define platforms for OEMs to more easily reference. They are working with vendors to build devices that use stock Android as the default and custom applications that go over them. This means that Google can push updates to apps and the operating system just like they can with a Nexus device. Android L is the next version of Android. This version focus on a new design for mobile, tablets, desktop, and beyond. They call this Material Design. Basically it allows developers to add a depth perspective to any interface that automatically creates shadows and lighting. They also updated the font Roboto to work on any device. Even a watch. You can now define animation between apps at 60 frames per second. This animation system is available to mobile web developers as well. They also introduced Enhanced Notifications right from the lock screen. You can now swipe down on our notifications to load more info. They also introduced a type of notification called Heads Up Notifications. These notifications just display simple info that you can easily swipe away. They also introduced a type of authentication that you can define for things like your home location, or if your bluetooth watch is around. When these situations are present you can automatically unlock the device. I hate being that guy, but I was just thinking about something like this two weeks ago. A new Battery Saver mode lets you turn off features like automatic updates and background apps when the battery reaches a certain level. They stated that a Nexus 5 device can get an extra 90 minutes of battery life when using the new Battery Saver mode. Google then took a small shot at Apple for them adding features that Android has had for 4-5 years. They also pointed out that Android Play Services, the services that powers the Android experience works on 93% of all Android users. You can now factory reset your device remotely. Android L beefs up enterprise security. The intent is to prevent enterprise users from needing to carry around two devices. You can now make bulk purchases that are automatically deployed to enterprise level devices. Google cares about the mobile web. The first move they are making to support the mobile web is bringing Material Design to the web that runs at 60 fps. 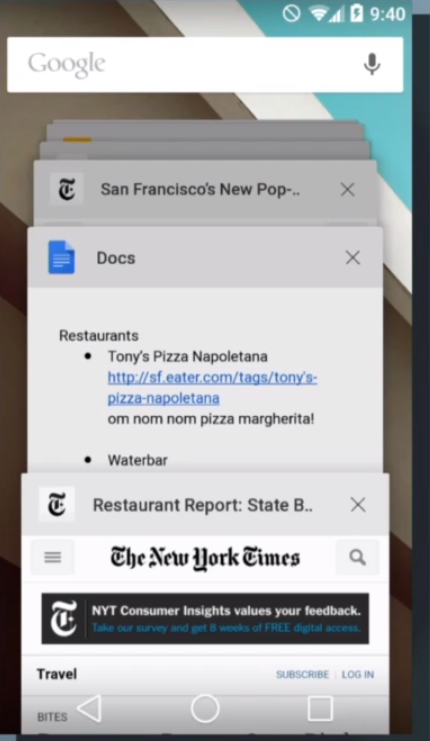 The next move comes from the redesigned Recent screen in Android L. Your Chrome tabs are now included with the recent apps. The last move deals with better support for App Indexing. Google search can detect if a user has your app installed to automatically open the link in your app. This App Indexing ability is also available to the stock Android search feature that lets you open content in an app from the search. App Indexing is now available to all apps. Android Wear is the platform for wearables based on Android. Android Wear supports both square and circular screens. People check their Android phone on average 125 times per day. With an Android wearable they will display the most important information in an always-on situation. For example, flight notification. You can swipe away a notification on a wearable device like on your mobile device. You can now talk to your watch to set reminders or notes that are automatically saved to your phone. You can set your watch into a “do not disturb” mode with a simple swipe. Step counting and heart rate notifications are possible with Android wear. If you follow someone on Pinterest you can receive notifications if you are near a location that person has Pinned. Google Maps’ turn by turn notification works with that screen. An app installed to your phone is automatically integrated with your watch. They demoed the Eat 24 app where they were able to re-order the pizza they had just ordered last week in 20 seconds. 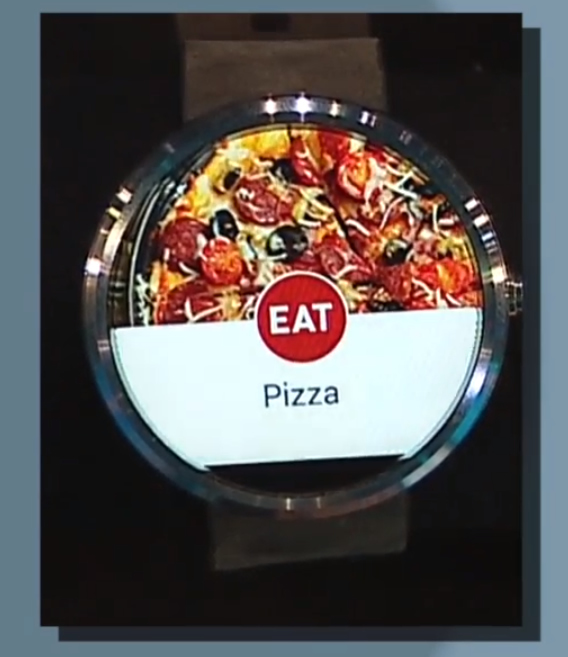 Android Wear makes it easier to order pizza. With the Lyft app you can call for a car to pick you up in your exact location. It will tell you the name of your drive and their location. The LG G Watch and Samsung Gear Live watches that are available for sale today. In January Google announced the Open Automotive Initiative. Today they have created Android Auto to create a contextually aware system that brings you only the info you need. Once you connect your Android phone to your car you can control with voice or buttons on the steering wheel. You can also control it with a touch screen if present, but this is discourage. Keep your hands on the wheel. Voice-enabled messaging is possible with Android Auto. These messages do not prevent you from seeing your directions using Google Maps. The Android Auto experience is available with the release of the Android L platform. Over 40 vendors have signed up to the Open Automotive Initiative. Cars with the Android Auto experience will roll off the lot this year. Android TV is giving the same experience for your phone or tablet to your smart TV. All that you need to control an Android TV is a device with a directional pad — a remote, a video game controller, Android Wear watch, smartphone or tablet. Pressing the home button displays content info over the program you’re watching. This lets you continue to watch your program while moving on to the next. Of course, Google Search works with Android TV. They pull info from the Google Knowledge Graph. Android Games from your phone easily transfer to your phone. Android TV supports any app that allows you to cast to your TV like you can cast content to a Chromecast device. All smart TVs from Sony will run Android TV coming this fall. Speaking of Chromecast, you no longer need to be on the same Wi-Fi network to cast to a Chromecast anymore. You no longer need to give your friends your Wi-Fi password for them to cast to your Chromecast. You can also create your own custom backgrounds from your photos that automatically scroll along your TV, or choose from a predefined set of photos. In a non-traditional use of TV, you can ask your phone “what’s currently on my Chromecast”. You can now mirror anything on your Android phone to a Chromecast. Initially this is only possible with select devices from LG, Samsung, and Nexus devices. This list will grow in the future. All 10 of the top ten laptops on Amazon are Chromebooks. They have seen the Chromebook experience in school has grown six times in the last year. The automatic unlock feature introduced in Android L allows you to unlock your Chromebook when your phone is present. Your Chromebook can tell you if your phone’s battery is low. Chromebook can now run many Android apps with very little changes. Google Fit is a single set of APIs that let developers create apps to share your fitness activity, but only with your explicit permission. This platform is similar to the Apple HealthKit platform announced at WWDC. This unifies all the data sources to a key piece of functionality. The Google Fit platform is a natural fit for integration with the Android Wear platform. Are you impressed by anything you’ve seen at Google I/O 2014? Please let us know. This post was originally published as Google I/O 2014 News for Brand Builder Websites.